Houses in Goduwali dhani village of Rajasthan’s Sriganganagar district are getting a makeover. Kaccha walls and roofs are being cemented, and marbles have been brought in for flooring. There are new tractors in the fields and SUVs are increasing on the roads. Resident Ram Karan Charan is planning to buy his first car, while Om Prakash is eyeing investment in real estate in Jaipur. Some 500 km away, Kanchan Singh in Jodhpur district is breathing a sigh of relief. He has cleared all his long pending dues. Farmers across Rajasthan have similar joys to share. Ask them the reason, they say “Guar ki kamaal” (Guar’s gift). A lesser-known bean, guar (cluster bean) is fetching farmers around Rs 140 per kg—a sharp rise from Rs 15 in 2010-11. In April-May this year guar touched Rs 250 per kg. India accounts for 90 per cent of the world’s guar produce, of which 72 per cent comes from Rajasthan. In 2011, the acreage under guar in the country was 3.2 million hectares (ha), of which Rajasthan accounted for 3 million ha. Guar was traditionally used to feed animals and is eaten as a vegetable. But it is the export of the gum made from the seed that is making farmers rich. About 90 per cent of guar gum processed in India is exported. This gum, which is actually in powder form, is made by grinding guar seeds and has unique thickening, emulsifying and binding properties. One tonne of guar makes 300 kg of gum. It is used in food, paper and textile industries. But most of the demand for the gum is due to the expansion of the shale gas and oil industries. Ninety per cent of the export is used to extract oil and shale gas—a natural gas trapped in shale formations. Seeing the profits, Haryana, Punjab and Gujarat have increased their acreage under guar. Andhra Pradesh, Karnataka and Chhattisgarh will soon start growing it for the first time. “Its countrywide acreage is expected to rise from three million hectares (ha) to four million ha this year,” says D S Yadav, deputy director of the Rajasthan agriculture department. 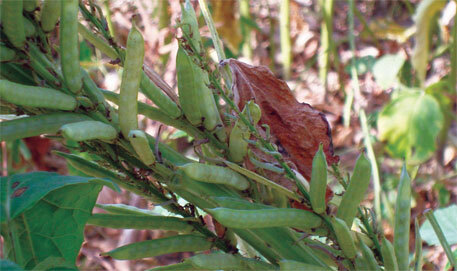 Guar is also eating into the area of crops like cotton in Punjab and Rajasthan. Before 2011, farmers were growing more cotton than guar because of high returns. But skyrocketing guar prices and low maintenance changed the scene. The price of cotton fell from Rs 70 per kg last year to Rs 38 per kg this year. The input cost of growing cotton is twice that of guar. Sunil Kumar of Sriganganagar had sown cotton in five bigah (one bigha=0.16 ha) and guar in two bigah last year. “This year I reversed the ratio,” he says. Punjab agriculture director M S Sandhu says cotton-growing districts including, Sangrur, Barnala, Bathinda, Faridkot, Fazilka and Ferozepur, are expected to use about 15,000 ha for their first guar trial this year. Guar offers more benefits. A rain-fed crop, it takes 14 weeks to grow and requires reasonably warm weather and moderate rainfall. It is sown in July-August and harvested in October-November. Being a leguminous crop, guar fixes nitrogen, making the soil fertile. If a farmer grows wheat on the same land, productivity is likely to increase by 30 per cent. The shale gas industry, which is expanding in the US and China, uses the gum in fracking—a process where a mixture of water (95 per cent), sand (4.5 per cent) and guar gum (0.5 per cent) is injected under high pressure into an oil-or gas-bearing rock to fracture it. The gum’s viscous property decreases fluid loss and friction, thereby reducing energy consumption and increasing gas or oil recovery. Even 0.001 to 0.05 per cent of guar gum can reduce friction by 20 to 70 per cent. As per estimates, the US alone has enough shale gas reserves to last 100 years. Another reason for the increasing demand is the change in drilling technology. Earlier, US companies used to drill gas vertically, in which 20,000-40,000 gallon fluid (1 gallon=3.78 litres) is needed per well. But recently, they combined vertical and horizontal drilling to ensure full extraction. In this case, fluid requirement rises to two million gallons, which means more gum. B D Agarwal, director of Sriganganagar-based Vikas WSP, a leading guar gum exporter, says, “About 80 per cent of the gum made from 1.2 million tonnes of guar harvested last season was exported for fracking.” Earlier, the gum export ratio for oil and gas, and food industries was 60:40, now it has become 90:10 because the food industry was not able to pay the high price (see: ‘Guar gum export’). In 2010, the gum was exported at Rs 1,600 per tonne; it now fetches Rs 15,000 per tonne. Traders estimate 2011-12 export was 0.6 million tonnes; last year it was 0.4 million tonnes. The general perception that expansion of the shale gas industry has resulted in a rise of guar gum price is half the story. 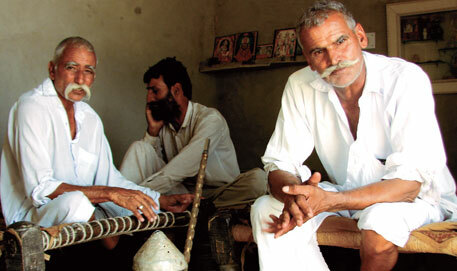 Purushottam Hisaria, president of Guar Gum Association in Jodhpur, explains the other half. “While traders were getting ready to buy guar in the marketing season beginning last October, the shale gas demand rose by 84 per cent,” he says. Knowing the produce is 20 per cent lesser than in 2010 due to aberrations in monsoons, heavy shortfall was speculated. Importing companies panicked and started placing orders for storage. Traders started hoarding the seeds to sell them at high prices. This increased the price of the seed for planting and processing from Rs 40 per kg in 2010-11 to Rs 400 in 2011-12. The price hike due to speculation and forward trading was so high that Forward Market Commission (FMC), a body under the Ministry of Food and Consumer Affairs, had to ban trading of guar gum in future market in March. In May, FMC submitted a report on the irregularities in guar trade to the ministry. Sources in the ministry say the food minister has not yet seen the report. However, they claim that future trading may be allowed by July-end or August after reviewing progress of sowing. The report, according to sources, states that of over 13,000 export houses that were monitored, around 5,000 made profits, while about 9,000 incurred losses. It indicts big firms like Ruchi Soya and Betul Oils for making profits. “Huge stocks were booked under various fake names,” say the sources. The report states that large existing traders should be asked to reveal the stock in their godowns. Banks and non-banking finance firms should be restricted from funding small and marginal traders because the lending helped them take positions in the future exchange, apart from adequate stock holding in the spot market, the sources add. Only 10 per cent of the farmers across the country who knew of the speculation sold their stored produce at premium rates of over Rs 200 per kg. The rest were happy in Rs 60-Rs 80 per kg offered by traders. Farmers say traders and processors made the most money by buying guar at lower prices and selling gum at high prices. “Everybody in the chain made good money,” says Bheru Jain, CEO of Rajasthan Gum Pvt Ltd in Jodhpur. The firm earned 10 times more than it did in 2011. More than 100 companies in Jodhpur contribute 40 per cent of the gum supply, adds Jain. Farmers have made big investment plans hoping guar would fetch good money in future as well. Some who had taken loans to buy seeds plan to repay through the upcoming produce. But amid these hopes lurks a silent fear. What if guar prices fall? “There are fair chances the prices will dip to Rs 50 per kg because of increased supply this season,” says Hisaria of Guar Gum Association. “This is still a good price,” he adds. However, Sanjay Pareek, vice-president, quality control of Vikas WSP, rules out the fall. “While demand from the US is increasing, China will start fracking from December,” he says. China claims it has 25 per cent more shale gas potential than the US. While the increase in a price of guar gum has brought cheer to farmers and traders, it has burned holes in the wallets of US companies. The industry paid the highest ever premium for guar gum in 2011-12: US $28,000 per tonne—a fourteenfold increase from last year. Halliburton, a leading provider of fracking services, is expecting a 5.5 per cent dip in its profit this year. According to reports, the cost of the gum accounts for 30 per cent of the cost of fracking. Halliburton is planning to increase the use of guar gum alternatives, which it did not disclose. Onset Worldwide Ltd, a provider of cost saving strategies, claims the oil drilling industry is already using guar gum replacements like Stabilizer EC (a proprietary blend of natural gums), but its details have not been disclosed. “Companies have experimented with the combination of xanthum gum (chemically produced) and guar gum but it has not given good results,” says Agarwal. Besides, the price of xanthum gum has increased threefold in the past year, he adds. Replacements would make sense only if the price of guar gum continues to rise. “We expect the prices to stabilise with the next produce,” says Agarwal. At present there is no competent replacement of guar in fracking, he adds. Guar replacements, both natural and synthetic, are already in use in food industry where it is used to make ice creams and bakery products. Glanbia Nutritionals, US-based ingredient maker, recently launched a flax seed-based gum to replace guar. The firm claims its usage will bring down the overall cost by 40 per cent without compromising quality. While farmers and industries are waiting to cash in on the next crop, the price is hinging on the monsoon. Both less and too much rain is bad for guar. Everybody is keeping fingers crossed. I am a trader of agri-commodities. Last two months I am seeing that gaur and Gaurgum price is going down, sir what is main reason of this factor. Sir, please give me an idea and what is real goingon in present. I hope you will help me and send me a query. Dear Mr Madan. The prices of guar are in stablisation mode right now. They had touched an abnormal high in March-April because of specualtion. But you do not need to worry. As per big export houses and shale gas companies the demand of guar gum is only expected to rise further because of the increasing expansion of the shale gas industry. Please tell me if dhaincha seed is used to produce gum by Guar Gum industries. If yes then what is quantity of dhaincha seed used. Also tell me the reason of rise in guar seed and gum prices. Sir, we are planning to cultivate guar seed for processing. What variety is suitable. We plan for 300 acres. From where can we get the quality seed for sowing at what price. Where can I sell the seeds. Will any company provide us an agreement for contract farming and financial assistance. Please tell me what seed is better for me for my profit this time in rajasthan Bharatpur district. I would like to cultivate Gur Gum in my farm which is near Hyderabad (approximately 100 kms from Hyderabad. I am seeing in the internet that abnormal prices are being realized by raising and selling that crop. Can you kindly provide me the details of good market near Hyderabad for Gur Gum, and also are the seeds sold or the pod as whole. I also would like to know where the quality seed can be procured for raising the crop and the cost for seed and also how much seed is required for one acre. I am planing to sow the seed in February next year is it the right time to sow. thank you so much for the effort you took to update m knowledge in this subject. i would like to grow gaur at our farm near guntur(AP)which is semiarid and has red sandy soil.which variety of seed would you suggest and the availability of the same and the contacts.kindly let me know the immediate cropping time.please remember that it is grown exclusively as a commercial crop i.e.,for supply to gum producers. I would like to know whether Guar can be grown in Kerala (in the district of Ernakulam, to be specific), and if yes, who to consult, how to procure the seeds, etc. Initially, on an experiment basis, I could allocate some half-acre of land for the purpose. I would greatly appreciate it if some one could kindly guide me in this regard. (Payment of a reasonable consultation fee is no problem). I am fascinated by what has been going on with guar; however, I can not seem to find out what price guar is currently trading at. Do you happen to know of any sites where I can see what guar (seeds, splits, and gum) trades for? The only prices I can find are what people write about in articles like this one. Iam planning to harvest Guar Gum in my land from 65 Km, from Hyderabad Dist, Mahabubnagar. Im working on hydraulic fracturing b means of guar gum in tight gas bearing formations.. It is my final year engineering thesis topic.. If u know some thing about this topic kindly guide me. i manjunatha studying phd in agricultural economics, university of agricultural sciences raichur, karnataka.i am taken research topic regarding guar production and market potentiality in north eastern karnataka.i need your help to further continuation of this study. What would be future demand for guar seed weather rising or dipping ,and what would be estimated price in 2017. Bcoz i have 20kkg guar right now. So plz tell me when i should sell so that i will get good amount.